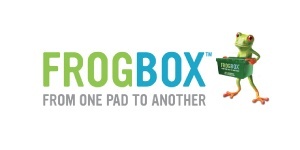 FROGBOX is the convenient, affordable and eco-friendly alternative to cardboard moving boxes. Traditional moving supplies are harmful to the environment and time consuming to organize. FROGBOX will deliver reusable moving boxes and supplies to your home or office and pick them up when you’re done moving. **Calgary Location Only** Receive 15% off of your total purchase with FrogBox. In addition, you’ll receive 5 extra FrogBoxes with your order!